What they're saying: So, what if Nick Foles actually leads Eagles to a Super Bowl win? 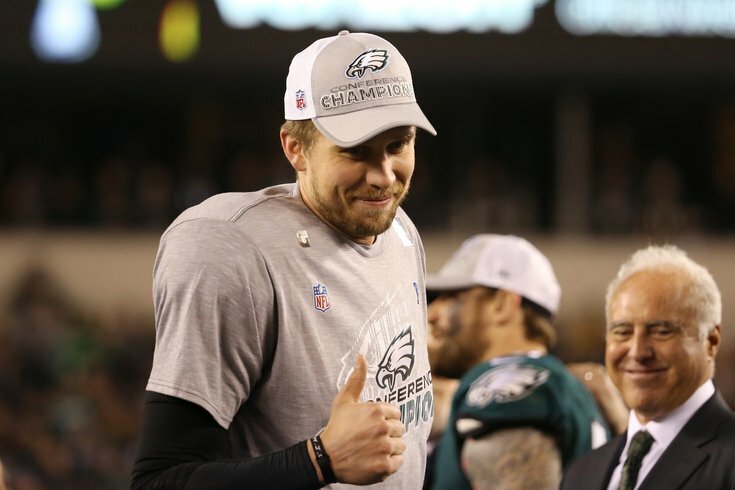 Philadelphia Eagles quarterback Nick Foles celebrates as Eagles owner Jeff Lurie looks on after defeating the Minnesota Vikings in the NFC Championship Game. For the first time in quite a while, the majority of Eagles headlines on Friday and Saturday had to do with injured starter Carson Wentz, who hadn't spoken to the media since his injury, and when he might be ready to return to action. While the 25-year-old quarterback with the NFL's most-popular jersey in 2017 acknowledged that his injury was actually worse than expected, he maintained that his goal is to be ready for the 2018 season opener. Whether or not that is actually the case remains to be seen – Wentz even hedged by saying that rehabbing injuries is a fluid process and noting that we're still very early in the process. So what does that mean for Nick Foles, the guy who replaced Wentz and has the Eagles one win from their first-ever Super Bowl title? And that means a trade. Because, unlike what Eagles nemesis Mike Lombardi would have you believe, Foles is under contract with the Birds for next season. And if you're expecting a QB controversy in Philly, stop with that right now. Nick Foles' father, Larry, might have always thought his son would be back in midnight green, but even he didn't this coming. Larry Foles said this feeling grew stronger when his son signed with the Chiefs and former Eagles coach Andy Reid in 2016; Foles knew Reid and Pederson, who was the Reid’s Eagles QB coach when Nick was drafted, remained close. But Larry didn’t necessarily see Nick leading the Birds to the Super Bowl. Foles almost retired two years ago before opting to sign as a backup with the Chiefs for the 2016 season. This past offseason, Foles was again unable to find a starting job. But if he wins a Super Bowl? Let's just say Howie Roseman's phone might melt with all the calls from other general managers. One thing to consider is that, entering 2017, Foles did not land a starting opportunity despite several teams needing passers, but as the NFL often proves, things can change in a hurry, especially if a Super Bowl run is involved. Rebuilding clubs like the Arizona Cardinals make for some potential suitors, and Roseman's reputation for executing trades -- he's made more deals than any other team since first assuming personnel power in 2010 -- certainly increases the likelihood of a move. While they admit that the most-likely scenario is Foles remaining in Philadelphia, CBS Sports offered up nine other potential trade partners, listing why they might (and might not) work. Why it could happen: The Kirk Cousins saga is set to begin again. After franchise tagging him for two straight offseasons, the Redskins clearly don't want to give him the huge contract he's looking for. But they also can't just let him go after paying him nearly $44 over the past two seasons. Another franchise tag seems unlikely, given it would cost more than $34 million in 2018. But the transition tag could be on the table, as La Canfora predicted, which opens up the possibility of Cousins leaving. If Cousins does depart, will the Redskins feel comfortable with Colt McCoy? Maybe they'll prefer to bring in a relatively cheap option like Foles while continuing to build a solid team around the quarterback. I'm not sure what this has to do with Foles since he didn't make the schedule, but it's not a great stat for Eagles fans to be reading. However, it may not be as big of a deal as it seems – but you'll have to go read more of Scott's story if you want to know why. The Patriots and Eagles met in Super Bowl XXXIX, but they haven’t faced off now since 2015. And to beat the Patriots in the playoffs, you just may need to have some prior experience with them in the same season. Belichick may be known for making adjustments, but it would appear that opponents make their own adjustments to him when they face the Pats again. While teams tend to have a hard time figuring New England out on the first try, if they were able to learn something valuable from the first matchup, it has often served them well in the second game.